The last time I went to Langford Market, the store manager Davina had this crazy jumpsuit waiting for me. Davina is an amazing sales woman. She pushes me to try things on that I wouldn't normally try on and she tells me the truth about how things look. Davina: "I love it!" Me: "Does this... is this... a dropped crotch jumpsuit?" Davina: "It is, but with some chunky shoes you could work it! Right?" Me: "Maybe! 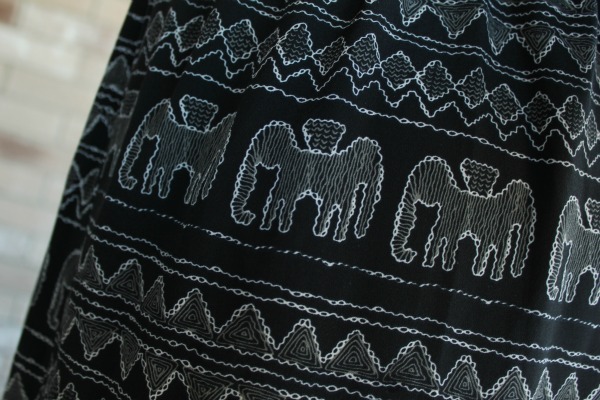 And I think if I blur my eyes a little, these are elephants! Oh, Davina, you know I love animals..."